Love this pillow so much! Comfort and support is great, especially for my neck issues! 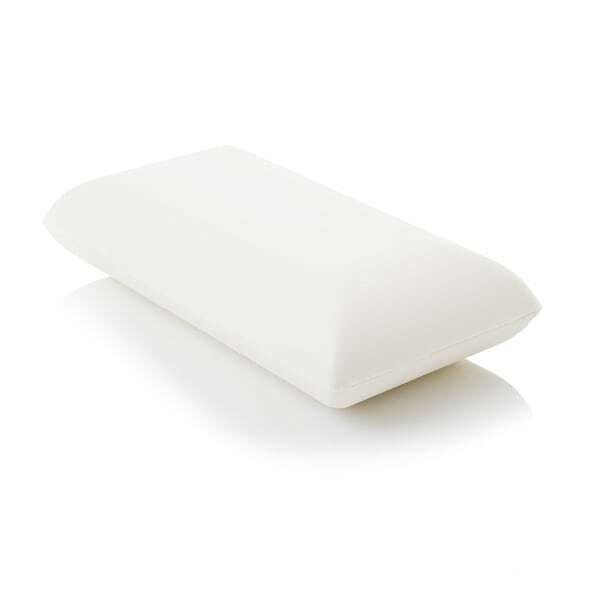 Create your perfect pillow experience with this dough memory foam pillow from Z by Malouf. Choose the size, loft, and firmness you prefer and find yourself sinking into your own personal cloud each night. This pillow also includes a luxurious velour cover and protects you from dust mites and allergens. I love this pillow! i bought mid-loft plush. If you open the over, you can tell the memory foam is very high quality. I've been sleep on it for a couple of nights. it feels very supportive. i've been suffering with neck issues for a few years. this pillow is definitely a saver! I had a King size in this same brand, the same loft as well. Owned it and slept on it nightly for over 4 years. It never changed from the first night, loft, shape etc. I only replaced it with queen size because my bed is now a queen and the king pillow was just too long. I am a side sleeper and this high loft is perfect for me. A true high loft pillow, finally! I am tall so I have broader shoulders than most women and I also have neck and back issues. I have been looking for a high pillow that would support my head and neck and take the pressure off my shoulders as I am a side sleeper. I ordered the high loft firm and it is great. It is really the highest pillow I have found anywhere (and I have looked at every store!!). The firm is nice, not too hard, but firm enough to support comfortably. I am thinking about ordering the high plush, too! I received my Z by Malouf Memory Foam pillow with luxurious velour cover today.It feels very firm.I ordered a mid plush.Not what I expected.I will keep it to see if I can make it work.I got the wrong pillow,I wanted the ones with the holes in it. Ordered the high firm and low plush. Low plush was to flat. Returning and ordering the high plush. My boyfriend ordered the high firm and loves it. I really like these pillows. The only thing is I wish the covers weren't quite so tight. It's a challenge to get them back on the pillows after washing. THe covers are awesome. Love how soft they are. My whole family loves the Malouf pillows and I was able to get this one for a steeply discounted price. No complaints. These pillows are comfortable and do not lose their shape. They look great in pillow shams and make the bed look so nice and neat..... almost like in a deccorating add. I bought this pillow and another that was similar. Big mistake. I can't use them. Not only are they too high, they're hard and your head doesn't sink into the foam. If you like a soft and sqooshy pillow, think twice about this one; especially the High Plush. The name "dough" fooled me. I thought my head would sink right into this pillow and be cradled, but this foam is hard. My head is held so high that my neck hurts. I tried to return it but found memory foam is not returnable. Guess I should have studied all of the info before purchasing. I won't order bed pillows sight unseen again, especially at this price. I can't imagine how hard the "firm" is. The lower size pillow might have worked but I'll never know. I paid almost $*** for something I can't use. My loss. So far away he pillows are very nice. The come with a nice soft white pillow case. No smell. My husband sleeps better and snores less. These are awesome pillows. I'm a repeat customer. Very supportive, does not lose its integrity. Pillow case is soft and comfy. Great pillow. Great price. Great service. Enough said. This pillow makes reading in bed feel like I'm sitting in an overstuffed chair. Now I can read for a long time while feeling comfortable. The pillow is firm and holds me in place. Nice pillow, just bought this one for a gift. Comfy pillow for my daughter. She loves it. Very nice constructed pillow, but very thick and dense. I tried to like it, but my neck didnt let me. Still think it's a good pillow, just not for me. Price was right and good rating.